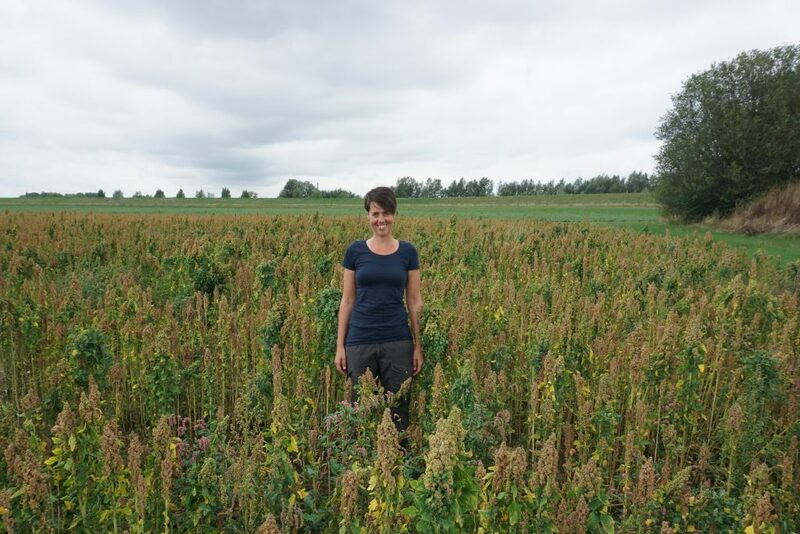 Quinoa of organic farm “de Lingehof” in the east of the Netherlands is ready for harvesting. At the 150 ha. arable farm, 3 ha. 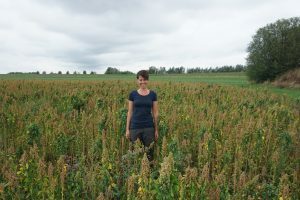 has been dedicated to quinoa, which farmer Petra Derkzen still considers an experimental crop. “At this second experience of growing quinoa on our farm, we are hoping for a yield of 3 tons per ha. However, the ripening of the plants is rather uneven, which may lower the harvest.” On the other hand, the crop has withstood adversities like the most prolonged drought ever recorded in the Netherlands. And immediately after sowing the plants experienced a spell of heavy frost. In this regard, the weather conditions resemble somewhat those at the high plains of the Andes, where the plant originated. The landscape of the fertile flood plain of the Rhine river in the Dutch lowland, however, could hardly be more distinct from the Andes highlands. Besides quinoa, farmers at the Lingehof also grow other innovative crops (for the Netherlands), such as blue and white lupin and soy. Potatoes and onions are the most important crops economically. Wheat and grass-clover crops are grown for their contribution soil fertility. Quinoa is not contributing much to farm income, says Ms Derkzen, due to the low yield. Nevertheless, with the Demeter (bio-dynamic) certification she hopes to get a reasonable price. A farmgate price of above 2.50 €per kg would be satisfactory. Quinoa growing at this and other Dutch farms is facilitated by the Dutch Quinoa Group, who are using varieties bred in the Netherlands from their Andean ancestors and adapted to temperate conditions.